In 1189 Richard I came to the throne but due of his lengthy absence on crusades his brother John effectively controlled the country. Prince John, married Hawisia, daughter and heiress of the Earl of Gloucester, and it was agreed in the marriage contract that he should inherit the estate on the Earl's death. Thus when the Earl died, John duly became Lord of Bristol, and with Richard away crusading, Prince John, Richards brother, ruled the country using Bristol castle his headquarters. King Richard returned to England in 1194. King Richard seemed a bit displeased with the way his brother had been running things in his absence and deprived John of his titles and lands. 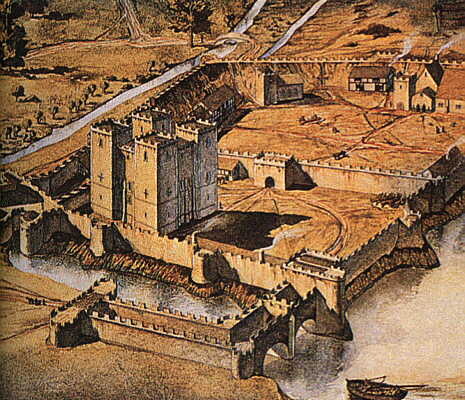 The garrison at Bristol Castle remained loyal to John though and defended the castle for a while. In 1196, Richard d'Orescuilz, probably an officer of the garrison, was fined 100s for being present at the siege. King Richard soon after dropped dead - mainly because he was hit by a crossbow bolt on 6th April 1199 and his brother, John, became King. He soon divorced Hawisia, but kept the castle, estates and title. On the 30th August 1204, King John of England commanded the erection of an enlarged castle at Dublin, Ireland, with strong walls and good ditches, for the defence of the city, administration of justice and safe custody of treasure. Although he had lost lands in France and was not the best loved monarch at home, he still had eyes for opportunities to gain power and wealth and Ireland fit the bill. The location of Bristol on the west coast undoubtably aided his exploits at this time. It wasn't a good idea to cross King John. Eleanor of Brittany, the granddaughter of Henry II, probably had a stronger claim to the throne than he did. She was made a prisoner by king John in August 1203 and kept at various castles in the area and remained a prisoner for thirty-nine years until her death at Bristol Castle aged 57, on 10th August 1241. Some consideration was given to her though as King John allowed her three maids, clothes and 5 marks a quarter for alms or pocket money. King John lived a very lavish lifestyle and the money to pay for it was raised by increased taxes. At this time it was forbidden for Christians to take interest for money lent, but Jews, under the protection of the King were exempt. The increase in trade that England in general and Bristol in particular, were enjoying meant that money had to come from somewhere and the Jews were the people to supply it. Because people resented paying interest to the Jews they were unpopular and so they kept to themselves. In Bristol, the Jewish 'quarter' was by the Quayside between Broad and Small Streets. For the King's protection the Jews had to pay dearly. Due to his lifestyle, King John, was always short of money. When the Jews became reluctant to give him more money he ordered all Jews in the country to be seized and held to ransom. From one Jew in Bristol 10,000 marks (£6,666) were demanded, this was a huge sum and it is commonly held that this was the sum demanded from all the Jews in the town. When the man refused to pay John ordered that one of his teeth be pulled everyday until the sum was paid. The Jew held out for seven days before the money was forthcoming. By now, it wasn't only the Jews who hated King John, the Barons revolted captured London and forced him to sign the Magna Carta. The Barons and people around Bristol stayed loyal to King John, and when Louis of France arrived, in 1216, to help the rebel Barons it was to Bristol that King John returned. He left Bristol to meet Louis arriving at the Wash where he was killed. On his death, the Barons didn't need Louis and he was forced to return to France and John's nine year old son became Henry III, being crowned at Gloucester in 1216. The boy king ruled with several regents until 1241 when he was 25. The first regent was William the Marshall who governed until his death in 1219; the last was Hugh de Burgh. Henry was grateful to the citizens of Bristol and again reaffirmed the rights of its citizens. He probably also granted them the right to choose their mayor, and the first one took office in 1216. The castle may have been impressive but very expensive to maintain. It always seems to have been underfunded, and like the rest of the city's defences often neglected and in need of repair. 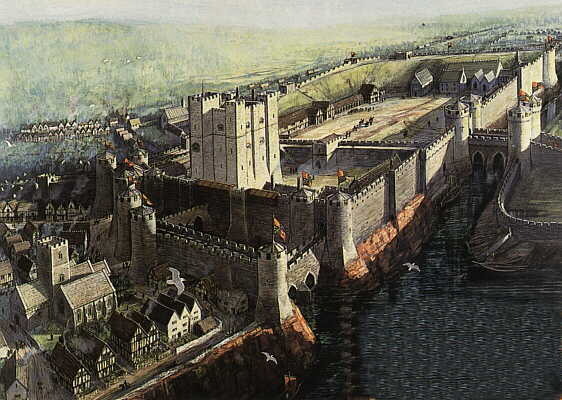 During Henry III's reign the city's defences were again being strengthened and on 15th June 1232, he granted Bristol the right to raise special taxes for a period of two years to pay for the improvements. Nethertheless, by reason of this our grant of these premises, nothing shall be taken after the completion of the aforesaid two years; but immediately on completion of that term the same Custom shall cease and be entirely abolished; and therefore we command you that, in aid of inclosing the town aforesaid, you shall take the aforesaid Customs unto the end of the said term, as is aforesaid. In witness whereof we have caused these our Letters to be made Patent. Witness myself at Woodstock, the 15th day of June, in the sixteenth year of our reign. Peace didn't last long as Henry III proved to be very unpopular and in the spring of 1264 England descended into civil war. Trouble started for Bristol when the people were asked to pay to put the castle in a state of defense. Prince Edward was besieged in the castle, from where he managed to escape. A while later the Prince saw the futility of trying to calm the people and ordered the Governor of the castle to yield to the townsfolk. A fleet of ships set out from Bristol for Wales to bring Simon de Montford, the main rebel Baron back up the Avon. This fleet suffered severe losses when it was attacked by three of the Prince's galleys, which managed to sink eleven ships from the fleet. This was bad enough for the rebels, but then Bristol castle fell to Royalist forces in 1265. The town was fined £1,000 for it's part in the civil war. Whereas we lately granted to the good men of Bristol certain customs for eight years in aid of inclosing the town. And the Castle of our Son at Bristol requiring great and immediate repair, we will be repaire at all speed. Therefore we grant that our Son shall receive, by the hands of his constables, all monies arising from the customs aforesaid for the repair of the Castle during the time aforesaid. Dated at Stafford, May 10th, in the 51st year of our rein. Prince Edward became Edward I (Edward Longshanks) in 1272 and his laws and kingship greatly increased trade, Bristol prospered again, for a while anyway. Edward I gave the castle to his Queen, Eleanor of Castile, who rented it out to the Mayor of Bristol. For this reason Bristol at the time was called the "Queen's Chamber". Until the reign of Edward IV (1461-70), the Bristol Mint struck only silver coins (halfpennies, pennies, half-groats and groats). From then on, it was licensed to strike in gold as well. Repairs to the Castle at this time might have been to make it more secure for the gold that was going to be kept there. During the first reign of Henry VI (1422-1461), orders were issued to open the mint in Bristol, but no coins are known from this period so presumably the mint did not actually open. It was issuing coins during the first reign of Edward IV (1461-1470), when it first produced coins in gold. Repairs to the Castle around this time might have been to make it more secure for the gold that was going to be kept there as on 6th July 1465, William Melsounby and Thomas Cartlage and assistants were ordered to strike coins in both gold and silver. The gold coins produced for Edward IV were the ryal (value 10 shillings or 50p) and the half-ryal. This mint was closed on 23rd July 1472. The mint was operating for the seven months of the second reign of Henry VI (1470-1471). It produced angels (6s 8d or 34p) and half-angels, and silver groats, pennies and halfpennies. Some of these coins were probably melted down and restruck by Edward IV during his second reign (1471-1483) and succeeding monarchs. 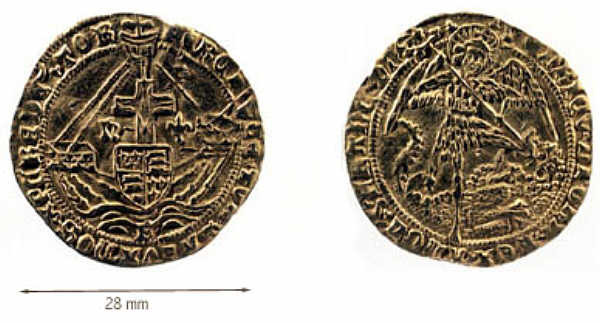 The Bristol-struck gold coins of Henry VI are thus rare. The mint reopened between 14th April 1471 and 23rd July 1472 when £117 was struck in gold and £903 in silver. The mint was then closed again until 1546. Bristol was now the only mint outside of London creating gold coins and to have its own engraver. The mint also made the coins for Ireland. Sharington purchased Lacock Abbey and converted it into his residence, and was knighted on 20th February 1547 by Edward VI. But, he turned out to be a bit of a scoundrel. Apart from his political beliefs, Lacock was also very expensive to maintain. Henry VIII died on 28th January 1547 but Sharington went on producing coins with his name and portrait on them well into the reign of Edward VI. In January 1549 he was arrested for this, other currency frauds including coin clipping and for assisting Admiral Sir Thomas Seymour against the Lord Protector of Somerset. Sharington confessed, blamed Seymour who was later beheaded, and escaped with almost without punishment except forfeiture of some land. Sometime later Sharington was presented with a royal pardon and upon the payment of £12,866 regained all of his lands including Lacock. 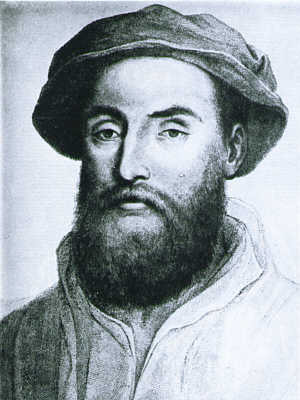 Chamberlain was sent to Denmark as an ambassador in June 1549 and Recorde became the Under-Treasurer until the mint was closed on 31st October 1549. It was during this minting (1546 - 1549) that much gold plate from the cathedrals of Wells and Salisbury as well as the churches of Bristol were melted down at the mint. During the reign of Elizabeth I (1558 - 1603) the mint was producing lead tokens, so tokens with things like "John Brown: Grocer in Bristol" were not uncommon. Around 100,000 of these tokens were minted. During the civil war in August or September 1643, Charles I's moneyer, Thomas Bushell was ordered to create a mint at Bristol. 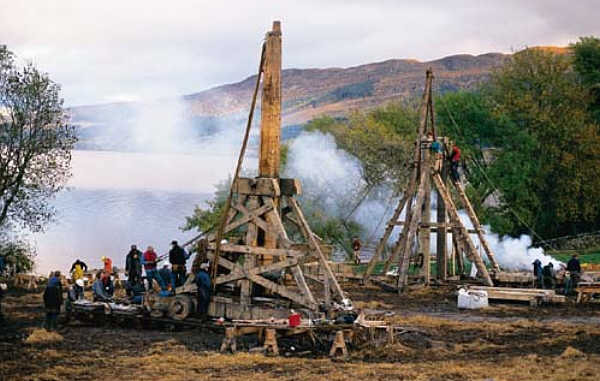 This operated until shortly before being taken by the Parliamentarians on 11th September 1645. This was the end of the mint at Bristol Castle. In early 2005, Bristol Museum purchased a Henry VI angel. On the obverse (head) is the Archangel St Michael killing a dragon, a beautiful piece of sculpting considering that the coin is only 28 mm in diameter. On the reverse (tail) is a ship: in the waves below it is the letter 'B' for Bristol.